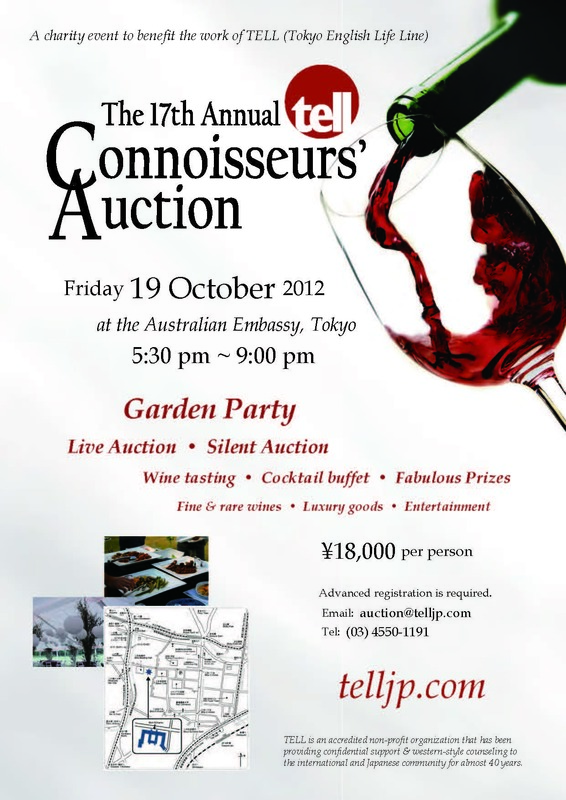 Recognized as Tokyo’s premier event for connoisseurs, some 400 distinguished members of the community will gather in support of TELL (Tokyo English Life Line) at the Australian Embassy, Tokyo for the 17th Annual TELL Connoisseurs’ Auction on October 19th, 2012 from 5:30pm to 9:00pm. Guests to this gala fund-raising event will enjoy a lavish menu of foods and many fine wines from all over the world with thanks to some of Tokyo’s best caterers and wine distributors. The night will also be chock-full of entertainment by some of Australia's and Tokyo’s most talented artists, all contributing their time and prestige toward helping TELL. The highlight of the Connoisseurs’ Auction is the Live Auction. Be it boutique, unique, antique or gigantic, guests will have over 40 lots of select wine, extravagant getaways and exceptional offers to choose from. The Silent Auction will have something for everyone; and with Christmas just around the corner, it is a great chance to pick up something special, like a night out on the town, hotel accommodations, fine wines, home wares or art for the home and office. Tickets are by reservation only and available until October 15th, 2012. Names of all those attending must be submitted in advance for security purposes. Proceeds will benefit TELL, a non-profit organization that has provided free & anonymous telephone support through its Life Line, professional face-to-face counseling with TELL Counseling Center, and the TELL Children & Families much-needed services & community outreach programs for the international and Japanese communities for almost 40 years. It is an accredited non-profit organization, a member of the Federation of Inochi No Denwa, an affiliatae of Lifeline International, and accredited by the Samaritan Institute. Funds raised at the event will help ensure that TELL continues to be able to provide these invaluable services to our community.